Update: 11:55 p.m. BART and its two biggest labor unions have just announced that talks are breaking up for the night and will continue tomorrow at 10 a.m. There will be no strike tonight. But the unions issued a 72-hour notice of a strike, meaning a walkout could begin as early as midnight Sunday. BART running normal service Friday and over the weekend. BART, unions will resume talks at 10 a.m. Friday. Unions says BART General Manager Grace Crunican expected to join negotiations along with two BART directors and other elected officials. Unions gave 72-hour notice that they could go on strike at 12:01 a.m. Monday. Pay, health benefits appear to be major obstacles to agreement. The announcement means BART will run regular service Friday and over the weekend while negotiators try to settle a contract dispute that has persisted despite more than six months of negotiations. Despite announcing tentative progress on worker pension payments last week, the two sides are apparently still far apart on pay and health-care benefits. Roxanne Sanchez, president of SEIU Local 1021, said the unions were were encouraged that two members of the BART board of directors — who were not named — and other "Bay Area legislative leaders" had joined the talks. Sanchez also said that she expected BART General Manager Grace Crunican would join the talks Friday and remain involved until an agreement is reached. "We believe that these developments can only help bring a resolution to these long, drawn-out negotiations, and for this reason we will continue bargaining throughout the weekend," Sanchez said. She also expressed hope that there's still time for a settlement before the 12:01 a.m. Monday strike deadline. "With the board getting involved and the legislative leaders assisting and the general manager willing to sit down at the bargaining table that the unions are continuing to negotiate and hope to avoid a strike," she said. Update: 11:45 p.m. Thursday: The BART talks continue in Oakland, with a couple of interesting wrinkles to report. First, despite BART saying more than six hours ago that it was about to present a new offer to the unions, that offer has not yet been presented. Reporter Alex Emslie has been staking out the talks all evening for KQED, and said BART spokesman Jim Allison acknowledged the agency hadn't presented the offer after the earlier announcement. He suggested it was because state and federal mediators control the negotiation agenda. What everyone wants to know is will the trains be running in the morning. We still don't have a certain answer on that with just half an hour to go before Gov. Jerry Brown's 60-day cooling-off periood, called in August to give BART and the unions time to sort all this out, expires. Meantime, KRON4 reports that a court in San Francisco has freed the infamous naked 16th Street BART gymnast. Yeiner Perez was arrested at the station in May after a frightening escapade during which he physically accosted several passengers, threatened others, and did an extended impromptu acrobatic routine. Unions publicized a video of the incident (here) to highlight their contention that BART management has not paid enough attention to their safety concerns in contract talks. 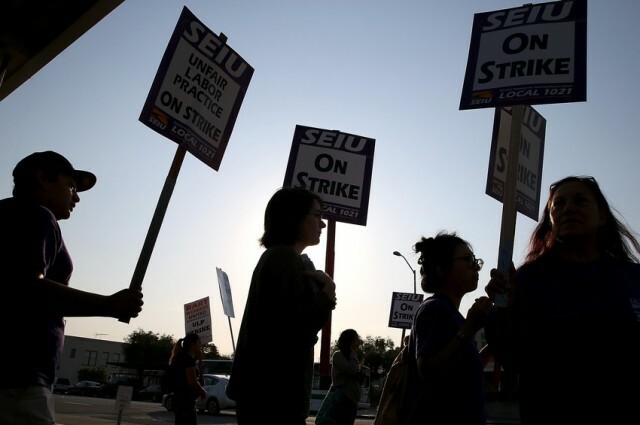 Update: 5:15 p.m. Thursday: Mercury News reporter Mike Rosenberg reports that "as of 5 p.m., negotiations were continuing, but no deal had been reached and the unions had not announced whether they would strike." BART negotiators were preparing to submit a new offer Thursday afternoon in hopes of averting a strike. The graph is from a new poll by SurveyUSA. It shows that support for the unions has dropped: Fifty-four percent of respondents say that the unions should accept BART management's offer, up from 40 percent on Oct. 4. Sixteen percent say BART should accept the unions' offer, down from 24 percent on Oct. 4. Update: 2:30 p.m. Thursday: With less than 12 hours until another BART strike becomes possible, union representatives appeared at this morning's open BART board meeting in Oakland and repeated charges that the agency has backed away from the terms of a tentative agreement. Union comments also suggest that BART's pay offer — a 10 percent increase over four years, at the same time workers make new pension contributions and increase what they pay for medical benefits — is still a huge stumbling block. Alex Emslie, reporting for KQED from the meeting, says union members called on the board to send General Manager Grace Crunican into the talks as time has grown too short to conduct the back-and-forth through state and federal mediators. But BART spokesperson Alicia Trost said Crunican would enter the talks only when negotiators were "inches away" from an agreement, and that hasn't happened yet. The two sides resumed negotiations at Caltrans District 4 headquarters in Oakland at 1:30 p.m. The BART board unanimously approved a plan to spend up to $400,000 a day on replacement bus service if workers go out on strike.
.@seiu1021 told #Bart board- management's 10% wage increase offer is actually .67% decrease w/medical and retirement benefit cuts. #BART unions want board to order GM Grace Crunican to bargaining table. "There's only 15 hours left." Earlier post: BART unions are angrily accusing management of backing away from a possible contract agreement while the agency says a "miscommunication" is to blame for a new misunderstanding with the unions. The BART chapter of SEIU Local 1021 and the Amalgamated Transit Union Local 1555 issued a statement Wednesday night saying the agency had "pulled the rug from underneath the unions as well as the entire Bay Area" by withdrawing an offer they said had moved the two sides close to an agreement. "Today, the unions came to the bargaining table with the hope that we could close the gap and reach a final agreement," the statement said. "However, we were completely taken aback when BART Management backed up and withdrew their offer, claiming to have been confused the day before." The statement accused BART of lying to the unions. But BART spokesman Jim Allison said the unions had gotten it wrong. "It is not true that we had a proposal on the table that was withdrawn. I think it's more a case of miscommunication involving the mediator, working between all three parties," he told reporters outside Caltrans' District 4 headquarters in Oakland, where the talks have been underway. Both BART and the unions said they would return to talks Thursday — after a 9 a.m. BART board meeting at which directors are expected to discuss spending as much as $400,000 a day on replacement bus service in the event of another strike. The dispute comes after several days of publicly conciliatory comments from both sides in the talks and raises concerns that the unions could strike when a 60-day cooling-off period ends at midnight tonight. Unions have not issued a notice that they intend to strike now, but that notice is optional. Several major issues reportedly remain unresolved in the talks, including pay, health care benefits, and what union members will pay into their pensions. A new SurveyUSA poll for San Francisco's KPIX-Channel 5 suggests the public wants the BART standoff resolved once and for all. The survey of 800 adults, conducted Wednesday, shows that 60 percent strongly oppose a strike while 12 percent strongly support one. Fifty-three percent of respondents said they agreed state law should be changed to ban future strikes while 38 percent said the law should stay as it is. Before Wednesday night's dispute, union officials had expressed confidence that a new contract was within reach. "We're less than $30 million apart," said Chris Finn, part of the negotiating team for ATU Local 1555. "And with a $127 million surplus one year, and they have that surplus, at least, every year for the next 10 years, it's well within their power to resolve this and settle this immediately." In an interview with KTVU, BART General Manager Grace Crunican said that surplus is to cover the agency's bond debt payments and capital expenses like replacing its aging fleet of train cars and improving infrastructure. "They would like that money not to go into capital improvement but instead go into the pockets of the unions," Crunican said. "And we need to find a fair way to provide compensation for our folks, but not investing in our capital and not paying our debt are not good choices." Update, 3:45 p.m. Tuesday: Negotiations continue at Caltrans District 4 headquarters in Oakland. San Francisco Chronicle transportation reporter Michael Cabanatuan told KQED that reporters monitoring the talks say it's a little hard to tell exactly where the talks are between BART and union negotiators at this point: "There's a media blackout. They've all agreed voluntarily that they won't talk to the media about what's going on at the table, but they all indicate that there's some progress being made, perhaps slow progress but progress nonetheless. The mood does seem a little different. It doesn't seem quite as somber or quite as angry, and that's a good indication." Update, 5:30 p.m. Monday: Officials for BART's two biggest unions just announced that they will not issue a 72-hour strike notice tonight and that talks with transit agency officials are continuing through state and federal mediators. Officials for the BART chapter of SEIU Local 1021 and the Amalgamated Transit Union Local 1555 said they were holding off issuing a strike notice to preserve every option as a court-imposed cooling-off period gets set to expire later this week. The unions issued strike notices three days prior to a work stoppage in July and before a pending strike in August that was later averted. The announcements are not required, however, and unions left the door open for a possible walkout if a deal is not reached by Thursday night's deadline. The strike notice is meant only as a courtesy so the 200,000 people who ride BART roundtrip each day could start looking for back-up plans to get around. Going into negotiations on Monday, BART said it was about $89 million apart from the unions over four years, but the labor groups have pegged the gap at $30 million over three years. Progress was reported last week, however, when both sides swapped a series of counterproposals after months where both sides barely blinked. Using BART's math, they bridged the gap by about $23 million last week. Original post: The 60-day cooling-off period in the BART labor standoff is set to expire late Thursday night, and new poll numbers show that Bay Area residents remain very unhappy with the prospect of a transit strike. With negotiations continuing, there are new signs that the two sides may finally be closing the gap in the contract positions they've staked out. The main issues still to be resolved center on pay, pensions, and medical benefits. The difference between the two sides is reportedly down to a total of $89 million over the life of the new proposed contract. Talks continue today. One sign that the hardline positions in the standoff may be softening is that BART has apparently dropped plans to have supervisors run limited train service during a work stoppage. In its latest update on strike planning, the agency says in the event of a strike, it's planning to run limited bus service from nine East Bay stations to San Francisco. The unions — chiefly the BART chapter of SEIU Local 1021 and the Amalgamated Transit Union Local 1555 — are seeking a pay increase of about 12 percent over three years. That compares to their opening position of 23 percent over four years. BART has offered 10 percent over four years. The unions have proposed additional small pay increases if BART ridership increases faster than the agency forecasts. On pensions, BART has sought to get the unions to agree to begin pension contributions at 1 percent of salary a year escalating to 4 percent by the last year of a four-year contract. Last week, the two agreed to a "cost-neutral swap" under which BART would pay workers 72 cents for every dollar the workers put into their pension funds. It's still unclear how the pension contributions and swap payments will figure into an overall settlement. The unions say they'll agree to a 15 percent increase in health-care contributions for all BART workers. Currently, union members pay $92 a month for medical coverage, even if family members are included. BART has proposed continuing flat-rate payments for individual members and limiting payments for family coverage to the least expensive of either a Kaiser or Blue Shield plan. For more on the negotiations, reporter Mina Kim spoke with Paul Roose, a mediator based in Oakland who oversaw BART negotiations in 2009.